As it is never too late, Chris Hejnar has just introduced Hejnar H126 a custom replacement foot for the older generation Canon EF 500 mm f/4.5 L USM Lens, with a style and length to meet the unfulfilled desires of the classic Canon telephoto lens users. The Hejnar H126 Replacement Foot carries the same design characteristics with the Hejnar H110 and H112 Replacement feet intended for the most recent IS versions of the long Canon telephoto lenses. Much like the sister products it is precision CNC machined out of a solid Aluminium block with a curved and textured top. The curved top acts as a handy grip in order to facilitate carrying the fairly heavy 3 kg lens, while the textured surface and the curved lip make it difficult to slip off of your hands. The optional mounting screw holes for 1/4"-20 and 3/8"-16 are pass through an show on the top surface, as do the four mounting screw holes on the rear block. 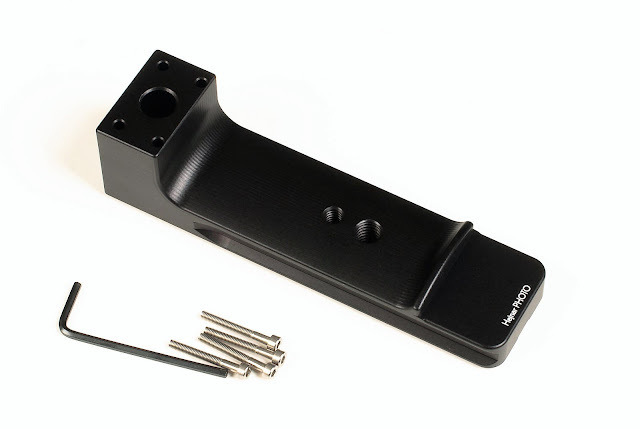 Hejnar Photo H126 Replacement Foot front top with textured grip and Hejnar logo. 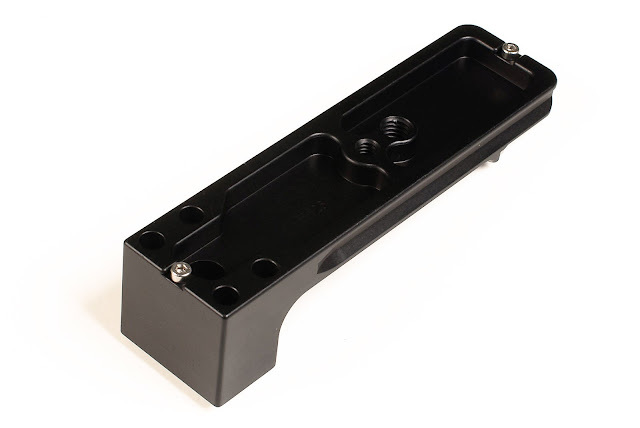 The front part of the foot provides a flat section, featuring a double dovetail, able to accommodate a flash bracket or any other device with a small Arca compatible clamp on the top dovetail. 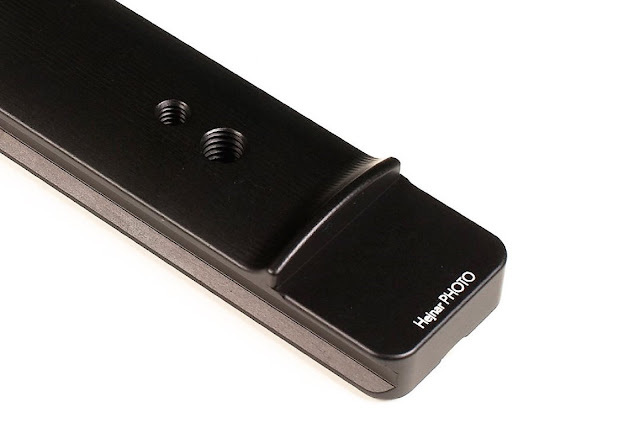 Hejnar Photo H126 Replacement Foot front double dovetail detail. The other side of the H126 foot, i.e. its bottom is deeply carved leaving a central brace, where the two tapped holes lay side by side, as forementioned one hole is threaded 1/4"-20 and the other 3/8"-16. Although an Arca compatible foot these extra threaded holes may serve for direct mount on any kind of pod with an equivalent stud. As usual two M3 safety stop screws are pre-installed one at the front end and one at the rear end of the foot depriving of any slip offs from a semi-closed QR clamp. Typical to all Hejnar replacement feet, the collar mounting block is almost solid with only a quite large center hole reducing some weight. On one hand being solid increases the weight but on the other hand it has better vibration absorption. Hejnar H126 Replacement Foot bottom illustrating the almost solid mounting block. Using the same four screws, one needs just to screw back and secure the Hejnar H126 replacement foot onto the lens collar. Hejnar H126 Replacement Foot and mounting screws with appropriate hex key. 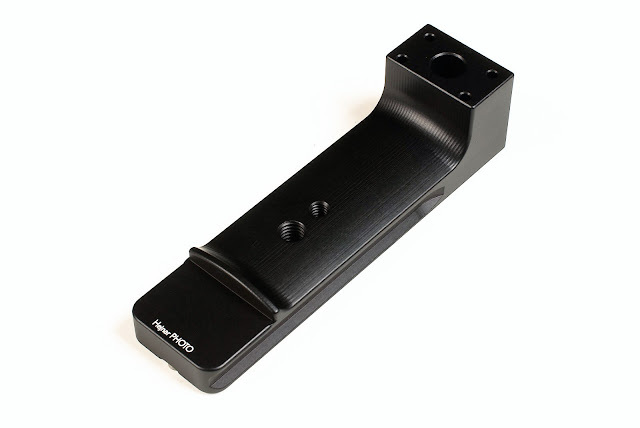 The Hejnar H126 replacement foot is exactly at the right size so its installation will not interfere with the Large Lens Hood when reversed for storage. 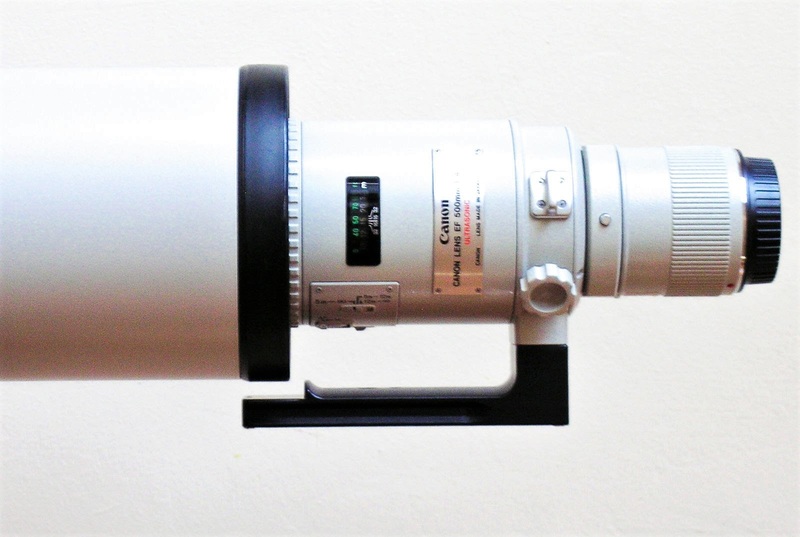 Canon EF 500 mm f/4.5 L USM with Hejnar H126 installed and Lens Hood reversed. 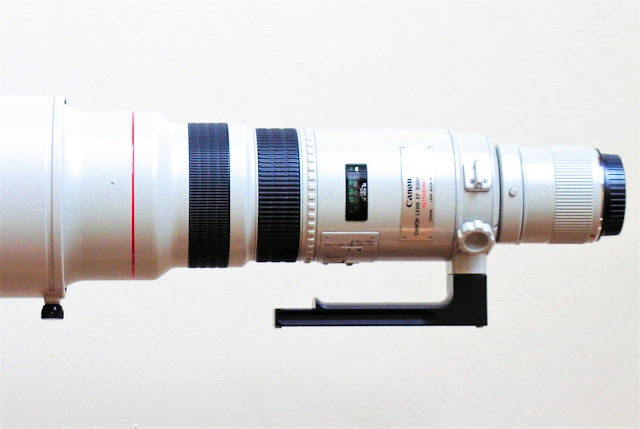 Nonetheless the H126 Foot can also be mounted on the classic yet also discontinued Canon EF 200 mm f/1.8 L USM lens. However, the difference is that due to the lens being shorter the foot blocks the reversal of the lens hood for storage or transport. 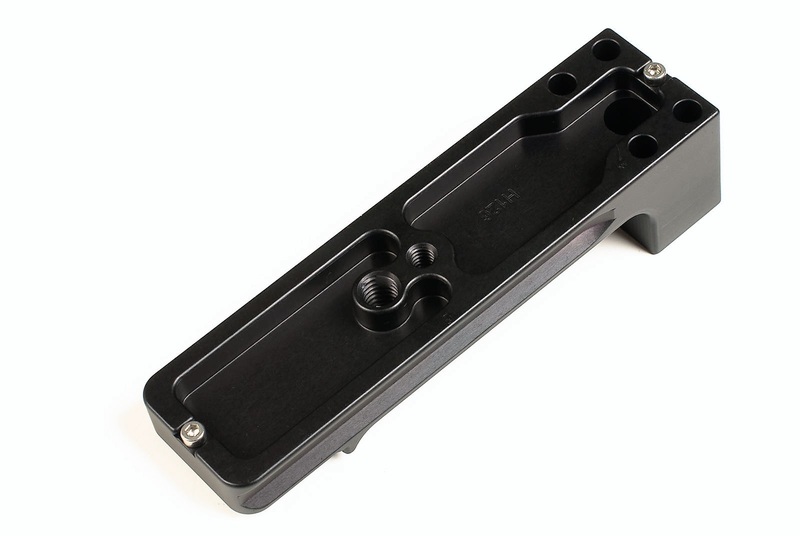 Hejnar Photo states that the dovetail design and dimensions of the H126 FOOT conform fully to the their standard, which are directly compatible with Kirk®, R.R.S.®, Arca-Swiss®, and many other Quick Release clamps that have adopted the Arca-Swiss dovetail style.